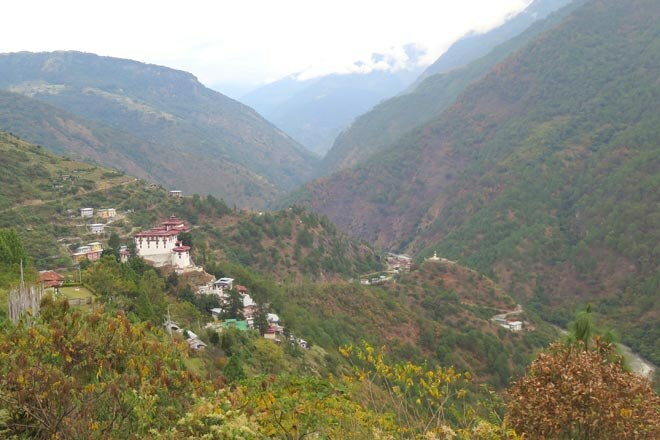 Our MD, Steve Berry, has recently returned from travelling extensively in the east of Bhutan and wants to share what a fantastic experience the 'other half' of the Thunder Dragon Kingdom is. "Historically Bhutan has been a country of two halves - the west and the east. Everything east of the Thrumshing La is regarded as east Bhutan, and once you cross the Thrumshing La, there is an almost indefinable atmosphere of 'old Bhutan'. Very few westerners get out this far. The pace of life slows down even further (if that was possible! ), but the temples and monasteries/fortresses are just as impressive. There are some absolutely fantastic things to see in the east and wonderful, mystical historical places to visit. My particular favourites were Lhuentse, which is the ancestral home of the Wangchuk family (present-day kings of Bhutan); Tangmachhu with its giant bronze statue; Khaine Lhakhang, one of 108 temples built by an early Tibetan king to quell the demon that hovered over the whole of Tibet, and Trashiyangste. Of course there is also the strange and quirky region known as Merak-Sakten where one of the reasons for creating a wildlife sanctuary was to protect the yeti, and where the Brokpa people speak a different language, wear completely different clothing and have hats made of yak hair that look like large spiders. Travelling to the east has always been difficult in practical terms. However, three things have happened in recent years to change all this. Firstly, an airstrip is now in full operation in Jakar in Bumthang. This means you can cut the drive to the east in half by flying to Jakar. Secondly, the road through to the east has been dramatically improved by the new government. The road is wider, safer and takes less time to travel. Lastly, the new government has abolished the tourist tax for all nights spent in the eastern districts in an effort to encourage people to visit." We currently offer three trips in Eastern Bhutan, each of which offers a different and unique perspective on this lesser-known side of the kingdom. Our Gentle Walking Eastern Bhutan visits many of the dzongs and temples highlighted above, as well as taking easy-paced walks in the countryside and spending a night in a traditional farmhouse homestay in the picturesque village of Ura. As a bonus, there is also time at the Tangbi Mani Festival. This is one of the most popular festivals in the Bumthang region and is a wonderful opportunity to see the Bhutanese people in their colourful finery enjoying the fabulous masked dances and hypnotic music of the festival. Rodang La, Eastern Bhutan is a superb trek that follows the ancient 'Red Rice' trading route across the high Rodang La pass to reach Tashiyangtse in the far east of the country. And, for a very different experience, our specialist Weavers' Trail holiday starts in the east then journeys to the west visiting artisan weavers in their homes and spending time in the most important textile centres of the kingdom. Led by Sue Lawty, one of Britain's finest textile artists, this tour is an in-depth exploration of the unique textile traditions of Bhutan where beautiful, brightly coloured material of the highest quality is still spun and woven by hand using techniques little changed over the centuries.